Hardcover, 12 x 9.75 in. / 84 pgs / 39 color / 21 bw. 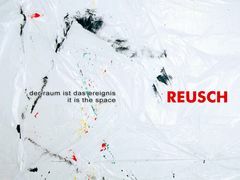 It Is the Space documents an exhibition by the German architect and sculptor Erich Reusch (born 1925), surveying works from 1935 to the present. This publication includes his well-known Plexiglas cases of the late 1960s, the Elektrostatische Objekte, as well as his various environments and sound and air works. FORMAT: Hbk, 12 x 9.75 in. / 84 pgs / 39 color / 21 b&w.